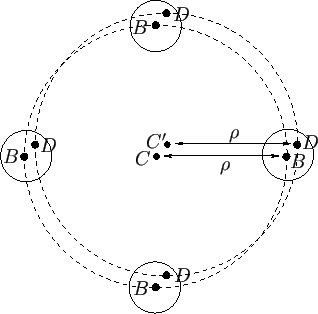 Figure 6.6: Two orbiting masses. In other words, the gravitational and centrifugal accelerations balance, as must be the case if mass is to remain stationary in the rotating frame. Let us investigate how this balance is affected if the masses and have finite spatial extents. Let the center of the mass distribution lie at , the center of the mass distribution at , and the center of mass at . (See Figure 6.7.) We wish to calculate the centrifugal and gravitational accelerations at some point in the vicinity of point . It is convenient to adopt spherical coordinates, centered on point , and aligned such that the -axis coincides with the line . Figure 6.7: Calculation of tidal forces. Figure: The center of mass distribution orbits about the center of mass in a circle of radius . If is non-rotating then a noncentral point maintains a constant spatial relationship to , such that orbits some point that has the same spatial relationship to that has to , in a circle of radius . Here, is the distance between points and . The gravitational potential generated by the mass distribution is the same as that generated by an equivalent point mass at , as long as the distribution is spherically symmetric, which we shall assume to be the case. to second order in , where the are Legendre polynomials (Abramowitz and Stegun 1965b). to second order in . Note that is the potential due to the net externally generated force acting on the mass distribution . This potential is constant up to first order in , because the first-order variations in and cancel each other. The cancellation is a manifestation of the balance between the centrifugal and gravitational accelerations in the equivalent point mass problem discussed previously. However, this balance is only exact at the center of the mass distribution . Away from the center, the centrifugal acceleration remains constant, whereas the gravitational acceleration increases with increasing . At positive , the gravitational acceleration is larger than the centrifugal acceleration, giving rise to a net acceleration in the -direction. Likewise, at negative , the centrifugal acceleration is larger than the gravitational, giving rise to a net acceleration in the -direction. It follows that the mass distribution is subject to a residual acceleration, represented by the second-order variation in Equation (6.74), that acts to elongate it along the -axis. This effect is known as tidal elongation. is (minus) the typical ratio of the tidal acceleration to the gravitational acceleration at . Let us assume that . By analogy with the analysis in the previous section, in the presence of the tidal potential the distribution becomes slightly spheroidal in shape, such that its outer boundary satisfies Equation (6.38). Moreover, the induced ellipticity, , of the distribution is related to the normalized amplitude, , of the tidal potential according to Equation (6.49) if , and according to Equation (6.44) if . In the former case, the distribution responds elastically to the tidal potential, whereas in the latter case it responds like a liquid. Thus, we predict that the tidal effect of the Moon (which is actually due to spatial gradients in the Moon's gravitational field) causes the Earth to elongate along the axis joining its center to that of the Moon by about centimeters. This elongation is only about a quarter of that which would result were the Earth a non-rigid (i.e., liquid) body. The true tidal elongation of the Earth due to the Moon is about centimeters [assuming a Love number (Bertotti et al. 2003)]. We have slightly underestimated this elongation because, for the sake of simplicity, we treated the Earth as a uniform-density body. Thus, the tidal elongation of the Earth due to the Sun is about half that due to the Moon. The true tidal elongation of the Earth, due to the Sun, is about centimeters [assuming a Love number (Bertotti et al. 2003)]. Again, we have slightly underestimated the elongation because we treated the Earth as a uniform-density body. Because the Earth's oceans are liquid, their tidal elongation is significantly larger than that of the underlying land. (See Exercise 9.) Hence, the oceans rise, relative to the land, in the region of the Earth closest to the Moon, and also in the region furthest away. Because the Earth is rotating, while the tidal bulge of the oceans remains relatively stationary, the Moon's tidal effect causes the ocean at a given point on the Earth's surface to rise and fall twice daily, giving rise to the phenomenon known as the tides. There is also an oceanic tidal bulge due to the Sun that is about half as large as that due to the Moon. Consequently, ocean tides are particularly high when the Sun, the Earth, and the Moon lie approximately in a straight line, so that the tidal effects of the Sun and the Moon reinforce one another. This occurs at a new moon, or at a full moon. These type of tides are called spring tides (the name has nothing to do with the season). Conversely, ocean tides are particularly low when the Sun, the Earth, and the Moon form a right angle, so that the tidal effects of the Sun and the Moon partially cancel one another. These type of tides are called neap tides. Generally speaking, we would expect two spring tides and two neap tides per month. As we saw earlier, for the Earth. Moreover, the tidal potential due to the Moon is such that . We thus conclude that the Moon causes the oceans to rise a maximum vertical distance of relative to the land. Likewise, the tidal potential due to the Sun is such that . Hence, we predict that the Sun causes the oceans to rise a maximum vertical distance of relative to the land. In reality, the relationship between ocean tides and the Moon and Sun is much more complicated than that indicated in the previous discussion. This is partly because of the presence of the continents, which impede the flow of the oceanic tidal bulge around the Earth, and partly because of the finite inertia of the oceans. Note, finally, that as a consequence of friction within the Earth's crust, and friction between the oceans and the underlying land, there is a time lag of roughly 12 minutes between the Moon (or Sun) passing directly overhead (or directly below) and the corresponding maximum in the net tidal elongation of the Earth and the oceans (Bertotti et al. 2003).